The financial crisis of 2008 is ongoing. World leaders are not solving it, but are rather using it to impose austerity measures upon entire populations. It’s not hard to understand — but if you don’t, you can’t act against it. This is a citizen’s and a women’s issue. 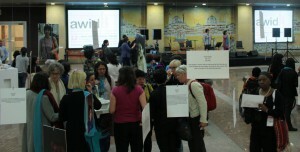 A summary prepared by AWID staff of the issues raised in the economic toolbox session “Demystifying the Financial Crisis: How the walls came crashing down” at the 2012 AWID Forum is included below. The recent financial crisis that originated in the US and had echo effects throughout the world is not, as it is has been portrayed, a one-off event or unique occurrence in our financial system. While it was the largest crisis since the Depression of 1929, there have been other similar crises (for example in the1980s in the US, Asia at end of the 1990s, Turkey was hard hit in 2000, as was the Soviet Union, the dotcom bubble in 2001/2002 and others), which showed that something big was beginning to brew. These crises have come about due to a systemic structure that places the financial industry in a place of the most power to influence other systems. This is followed in order of power by the real economy, society and the earth/environment with the least power in our system. What this means is that the financial industry exerts control over all other systems in this power dynamic. Women’s rights are directly impacted by this system, and this hierarchy needs to be reversed in order to advance human rights so that the economy and financial industry serve the needs of the people and not the other way around. The existing power system is influenced by financial lobbyists who, since the 1980s have been pressuring the government, succeeded in having deregulated a number of policies and regulations that kept the financial system and its institutions under control. After the Depression in 1929, President Roosevelt put in place several acts to protect society from being overpowered by the financial system. Significantly, the Glass Steagall Act enforced that there needed to be a separation between a commercial deposit bank (retail banks that make money through providing loans at marked up interest rates) and investment banks (financial houses that are more concerned with commercial transactions such as mergers and acquisitions, selling bonds on the market which make money through fees per service.) In 1999, this Act was retracted after years of lobbying from the financial industry so that insurance, retail banking and market activities could all exist under the same roof. Investment banks like Chase, City Corp. and Wells Fargo became institutions that were considered too big to fail because if they failed there was so much at stake that the government would have to bail them out. This created a fundamental change in the way capitalism functioned. These deregulations provided a climate that allowed new products to emerge to serve the demands of the financial industry. Promoted by the government, opportunities were given to poor, high-risk families to take out mortgages to buy homes. These mortgages were provided at low sub-prime monthly rates in the beginning that would double, and in some cases, triple, after a specified amount of time (a year or two.) The idea was that even if the families had to foreclose on the mortgage, the banks would still have the building (home) in tact. In financial circles, these were known as Neutron loans as they could destroy the people but leave the buildings in place; they were also called Ninja loans, as it was known that they were lending to people with low income and no assets who couldn’t protect themselves. To date, there are 10 million families in the United States who have been foreclosed on and left without a home. Financial institutions were able to sell these loans as investment products, by packaging them with other loans, including student loans and car loans, and mixing them up geographically. These packages were then parceled off and sold as safe investments. The extra push needed to make these securities a desirable product came from rating agencies that are responsible for indicating the level of safety of a financial product. These agencies are privately owned and compete with each other, resulting in Triple A (ultra-safe) ratings being handed out all the time. At the same time that the deregulations were affecting the financial market, they had similar impact on the food markets, including that of staple items such as wheat, corn, soya and rice. Historically, U. S. Farmers invest in these commodities markets and buyers (such as food manufacturers) also impact the market, investing in next year’s crop and buying their food ahead of time. Previously, there were regulations on who could invest in these markets and how much they could invest. This was to prevent any one from cornering the market; that is driving the price up, through their investment. The US food market sets the world price and so this was an important limitation needed to control the cost of food. This law was also retracted so that buyers did not have to identify themselves and investors could buy as much as they liked. When the subprime mortgages started to lose money, the financial industry turned to the food commodities market. In 2008, a huge influx of investments was seen in the food commodities market, with 20 times more money seen in these markets, than the average amount from 2004 – 2006. As another illustration of the colossal nature of this shift, in a single day, the price of wheat increased by 31%. This resulted in food riots throughout the world. This impacted heavily on women who have to make do with the budgets they have and still provide enough food for their family. According to FAO, during this time the number of those hungry increased to one billion people. This is yet another example of a small group of traders in New York impacting the rights of people all over the world. These interconnected events and resulting crises in the financial system highlight the problems of neoliberalism. Similar issues reverberated throughout Europe and the world. Governments bailed out banks and to date, for example, in the United States 16 trillion (16, 000, 000, 000, 000) dollars have gone to the banks to bail them out. These are funds that were diverted from paying for better schools or hospitals. Society paid for the crisis through hunger, losing their home, loss in pension funds. Even more aggravating, we are seeing that to compensate for this, the poor and middle class are being further taxed. A human rights based approach provides a framework to get the financial industry under control in order to serve the people and not vice versa.